I’m certainly catching up on my listening and crime books since my 3-month hiatus from the genre and medium! lol – And good literary crime is a favorite genre – literary meaning that the narrative likely has an interesting structure, thought provoking metaphors and allusions, some unusual insights into characters or the human condition and, possibly an interwoven theme or two. (Note to reader – literary fiction is not always that great, nor is it always appropriate for the general story). I don’t even use the term “literary” except as an adjective – I don’t really think it’s a genre although that could certainly be argued. I usually use the word “contemporary” with the date published or 20th century or some other main category. The double rating here is because I rate general fiction differently from genre (formulaic) crime fiction. This is so good it gets a score for each – another writer in this “literary crime” category might be Benjamin Black whose work does not fare as well but the work of John Bancroft (aka Black) gets 9s and up. 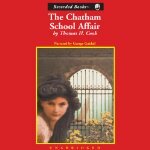 In The Chatham School Affair the 1st person narrator, Harry (Henry) Griswald, is an older man remembering certain traumatic days of his youth at the male boarding school which his father headed. One late summer in 1927 a beautiful, young and mysterious woman, Miss Elizabeth Channing, arrived to give instruction in art. From the beginning the reader is to understand by way of masterful foreshadowing that there will be a death and a trial (and more) as the narrative winds slowly to the details of those events. The story goes forward to the protagonist remembering the events, the deaths and the trial as he talks with a co-worker about the land being for sale. The suspense is riveting and (blush) I listened to this in almost one sitting – with an intermission for a good night’s sleep. Harry remembers the characters of that past, his father and mother, Leland, Abigail and Mary Reed, Sarah Doyle, all the while developing the riveting suspense. The chronology is not linear but full of back-flashes and digressions within the memory, much of it following the courtroom drama as it played out and as Harry remembers it. There are some really memorable lines. I’ll have to see what I can do about reading more Cook.